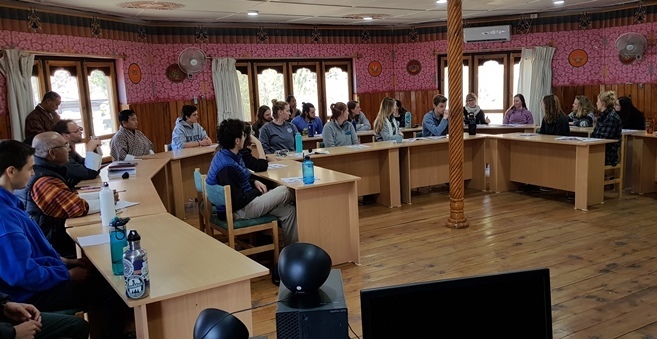 A three month Spring Semester Program on Himalayan Environment and Society in Transition begun from yesterday (January 28, 2019) with a group of 22 undergraduate students from different universities/colleges from the United States of America (USA). The Ugyen Wangchuck Institute for Conservation and Environmental Research (UWICER), Bumthang, the Bhutan Ecological Society (BES), Thimphu, and the SFS head office based at Massachusetts, USA jointly host this interdisciplinary field-based course in Bhutan. During the program, the students will study three main courses on i) Political and Socioeconomic Dimensions of Environment; ii) Mountain Ecology; and iii) Land Use, Natural Resources, and Conservation and also on Bhutan’s basic religion and culture.